Web publishing, whether it’s content marketing, blogging or social media, means that everyone is a publisher these days. If you knew you’d be writing so much and publishing it for the whole world to see, maybe you would have paid a bit more attention during high school English classes! Thankfully, there are tools available to improve your writing. They go well beyond the spell checker you grew up with. Here are two tools you can use, and both work within WordPress. Grammarly is one of the most popular editors. Not only is it free, but it can be integrated into many of the apps you already use including your browser and Google Docs. Because it works as a browser plugin, it will help you proofread any content you type in your browser: blog posts in WordPress, Facebook posts, Tweets etc. There’s also a plugin for Microsoft Office apps. The tool underlines misspelled words, missing articles, repetitive words, weak adjectives and more. Just hover over the highlights for an explanation of the error and click the corrected text if you want to make the change. The core Grammarly plugin is free but there’s a paid option with additional features. The premium version performs more checks, provides writing suggestions and even includes a plagiarism checker. It is $11.66 per month if you pay for a year at a time. Jetpack is a WordPress plugin-of-plugins that includes everything from social sharing to comment spam monitoring. 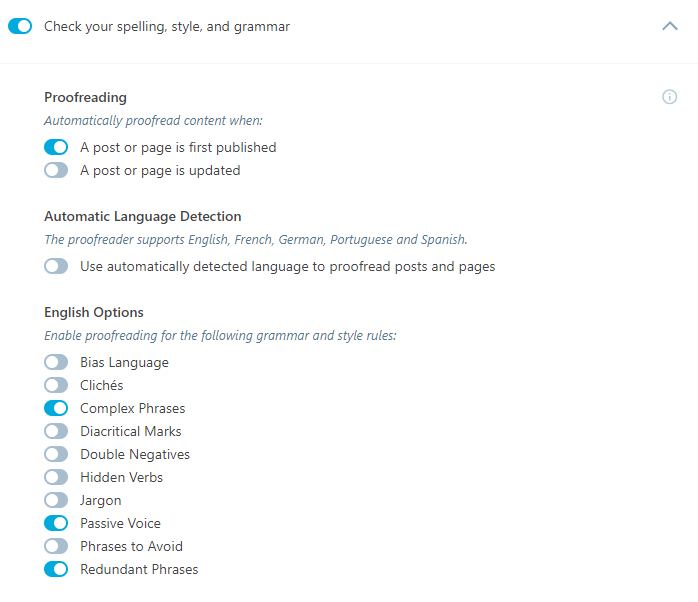 It also includes a nifty proofreader for your WordPress posts. Unlike Grammarly, Jetpack only performs checks when you publish or update a post. It does not run checks while you’re composing content. This can be frustrating because it won’t flag your errors until you have finished and hit ‘publish’. It also works better if you are using the visual editor rather than the text editor. It works similarly to Grammarly by underlining your errors. Jetpack is made by Automattic, the creators of WordPress. The proofreading tool is free. There are a handful of other editors out there but Grammarly and Jetpack are ideal for proofreading your WordPress posts. You might find it helpful to use both the free Grammarly version and Jetpack. Use Grammarly to check your content as you go, and then use Jetpack to catch other types of errors and for additional writing suggestions. Online proofreading tools are a big help. But remember they are not perfect. Don’t just accept all of their suggestions; make sure the proofreading tools understood the context of what you wrote. Your style guidelines might also differ from those in the tools. Grammarly calls out missing Oxford commas but many authors don’t include the final comma in a series. Ready to write more content and try out these proofreaders? Get started with EasyWP, Namecheap’s managed WordPress. Hemingway Editor is pretty good. Not sure if there’s a WordPress plugin for it. I use it separately.